On the 12th of December 2017, a Circular was released directed to tackle all medical advertisements in the emirates of Abu Dhabi. 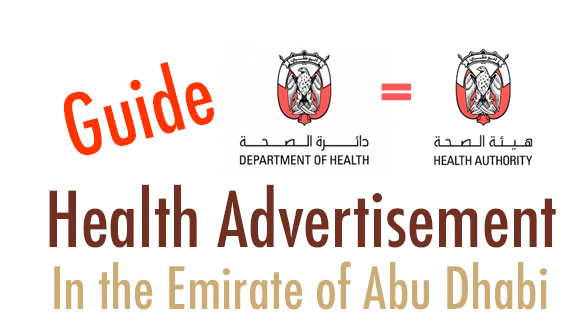 In the past, all advertisements’ approval was processed via MOH, but they wanted an additional step to make sure that the advertisements adhere with that of the Abu Dhabi if published within the boundaries of Abu Dhabi. The circular No. was DG/58/17, click here to read the circular itself. It states that prior to any type of advertisements to be published within Abu Dhabi, requires that it has a written approval for any type or form of advertisements ( TV, Radio, Brochures, posters, website, SMS, social media, magazine, newspapers). If the medical facility publishes any type of advertisements without approval they will face legal liability, First a warning, then a fine and finally legal action. Advertisement of services of medical or health facility, or doctors and health professionals. Advertisement of medical and health devices and means. Advertisement of medical or chemical products derived from natural sources. Caustion: approval of the advertisment via DOH doesn’t nejeclt the need of the MOH Approval. Both are needed for advertisment and approval. Provide a Valid Medical Facility license. Provide the appropriate medical staff lisence and/or equipment lisence. Provide the advertisement content/method of publishing. Stamp the application and sign ( write the email/mobile) for faster advertisement editing. To sum it: Fill in the application then attach the following “depending on the type of advertisement“: (medical facility license / medical staff license and/or medical equipment license which are part of the advertisement) and the advertisement itself (in all its possible alterations languages/ designs). make sure the attachments are all correct and email it all to [email protected] and wait for about one to receive in the email a stamp on the advertisement approving it. This will make you have DOH approved advertisement but you will still need a MOH advertisement approval. Advertisement of services of the health facility, doctors, and health professionals. Clear and valid copy of the facility’s license. Clear and valid copy of medical cadre’s license. Non-objection letter from Health Facilities Licensing Department for making use of services to perform surgeries. A contract with a licensed hospital for performance of the advertised surgeries. Registration certificate and attachments thereto. Operation manual of the device in both Arabic and English. Registration certificate of the device from an approved external body. A certificate to prove the efficiency of the device underworld researchers and proofs. Non-objection letter from Continuous Education Department; approving hours in case of an application for credit hours. Explanation of the campaign’s nature, themes, place, as well as those who will carry out the campaign and their specialization. Copy of professional licenses of the direct executors of the campaign. Documents of the product/ products used in the campaign. A letter explaining the campaign’s nature, themes, place, as well as those who will carry out the campaign and their specializations. Copies of licenses of the direct executor professionals. A letter from the institution revealing the nature of the event. Non-objection letter from the Continuous Education Department; approving the hours. Non-objection letter from conferences center (Culture and Tourism Authority). Advertisement of medical products derived from natural sources. Registration certificate and attachments thereto from Registration and Drug Control Department at the Ministry of Health. Certificate from the Registration and Drug Control Department to certify that the product does not need registration. Copy of valid license of the facility from the health body in the country of origin; approved by the Embassy of the United Arab Emirates or its representative. A written undertaking that the submitted data, documents and information are correct and that they bear the entire liability thereto. A letter explaining the details of the account and the purpose thereof. Valid clear copy of facility license. The application shall be submitted 14 days before the required date of the advertisement. The medical facility and treating doctor shall have a valid license from DoH. A detailed summary of the subject matter of the health advertisement shall be submitted. A written undertaking to abide by contents of the health advertisement, if approved, shall be submitted. When making a health advertisement through different types and forms of media; including press, printouts, visual, audio and print publication, cinema movies, electronic means or any other information technology means, the health facility shall ensure that the health advertisement and its content is consistent with the customs and traditions of the country and that the advertisement suits the proper decency. Further, the photos and writings shall abide by the Islamic morals and shall honor the rules of the standard Arabic language in the text of the advertisement. No advertisement shall be made for any matters that may harm the public health or third parties, mislead the public or result in indecency in public. Further, the content of the advertisement shall not contradict reality, deceive the public, and shall not be open to interpretation, construction or unguaranteed expectations. Also, it shall not exploit the trust of the consumer. In addition, the wording of the advertisement shall not cause the consumer to be afraid or to believe that he/ she suffers from a serious, harmful or infectious disease. Every licensee for advertisement shall abide by the vision and mission of DoH. The advertisement shall not violate the laws and regulations applicable in the country in general, and in particular, the laws related to publication, prints and using of electronic publication means. which means it still needs MOH approval even if it has DOH Approval. Avoiding exaggeration terms such as: “the unique, the incomparable, the unparalleled, the best products, beware of imitation, magic recipe, a miracle is achieved or others. Further, the text of the advertisement shall not deceive the public like saying “the quantity is very limited; quickly seize the opportunity….. etc.”. Further, it shall be away from comparisons. The advertisement and its content shall not be concerned with the treatment of diseases in ways and methods which effect and results have not been proved, recognized or licensed by DoH. The scientific and health terminology shall be correct. For advertisements in English, a legal translation in Arabic must be provided. The extension application shall be submitted before the expiry of its terms, in accordance with the first clause of the terms and conditions. The advertisement shall be considered null and void in the case of change or modification of the approved documents and content, or when it transpires that the approval was based on incorrect documents. The advertisement shall be considered null and void automatically on the date of expiry.